This month we are excited to have Christian chick lit author Kristin Billerbeck here with us. Kristin is the author of more than thirty books including the Ashley Stockingdale series, and her most recent romance "A Billion Reasons Why". 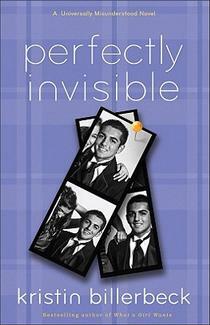 Her latest young adult release is the witty "Perfectly Invisible" and we are giving away a copy of this book. See the end of this feature for details how to enter! 1. Thanks for joining us on our blog today Kristin. Can you tell us a bit about yourself? Any hobbies you have? Well, I'm a mother of four, so my hobbies are mostly bus-driving and drinking espresso to keep me moving at a relatively clipped pace. I do enjoy meeting p with my girlfriends and we go to concerts and out to dinner. Our big luxury is going out to breakfast after church. 2. Jess read and reviewed, "A Billion Reasons Why", your most recent adult fiction. It was the first book of yours that either of us had read, and she loved it. Now we're hooked on your books! What was your inspiration for the character of Luc Deforges? Luc was a bit of an amalgam of many different men. Wouldn't that be great if we could glue the best parts together? Okay, maybe not But I wanted to give him the strength and consistency of a military man, the intellect of a business man and the heart of a godly man who knows what to value in life. 3. I absolutely enjoyed your recent Young Adult Fiction novel, "Perfectly Invisible". I couldn't put it down! Where do you get your ideas and inspiration for young adult fiction? I have three teenagers and one pre-teen so inspiration is everywhere! But I also remember the angst of that time when you're trying to find your way and figure out who you are. It's such an exciting time, but I don't think we appreciate it when we're going through it! 4. What books did you read as a teenager? Confession: i didn't read a lot as a child and when I did start reading, I went straight for the classics: Jane Austen, Charles Dickens, Thomas Hardy. Nerd alert! 5. Whose writing do you admire? I love Maeve Binchy's writing. I think she's a master and her storytelling always comes before the rules. That's what I love about her. I love Jenny B. Jones and Rene Gutteridge, who make me laugh and are so good with real emotions. I love Denise Hunter for romance. 6. When you get writers block, what do you do to try and get out of it? I generally have to get away from the book. I've learned if I sit there at the desk when the flow isn't coming, I will only waste my time. So I will get up and go to the movies, or watch Reality TV. Something that completely takes me away so that I can clear my head until I find my way back in the story. 7. If you could be any fictional book character for a day, who would you be, and why? Tinkerbell. She can fly, leaves a sparkly trail and I like her outfit. 8. Can you tell us about any of your current works in progress, and any books that are coming out soon? I have two books coming out Spring 2012. The final Daisy Crispin book (YA) which is called Perfectly Ridiculous and another adult fiction called "Paris in the Rain" closer to summer 2012. Thank you so much for visiting with us Kristin! Enter to win this entertaining book (which I loved, even though I'm a fully fledged adult!) either for yourself or for a teen you know. This is the kind of book I'd want my daughters to be reading rather than all those dark, vampire books out there. It's Daisy Crispin's final trimester of high school, and she plans to make it count. Her long-awaited freedom is mere months away, and her big plans for college loom in the future. Everything is under control. Or is it? Her boyfriend is treating her like she's invisible, and her best friend is selling bad costume jewellery in the school quad--and hanging out with her boyfriend. To top it off, Daisy's major humiliation for the year will be remembered in the yearbook for all eternity. It's enough to make her wonder if maybe being invisible isn't so bad after all. With more of the funny-but-too-true writing readers have come to expect from Kristin Billerbeck, Perfectly Invisible shows teen girls that everyone is special--no matter what they're going through. We have one copy of "Perfectly Invisible" up for grabs. To enter the competition, you just need to complete the form below. Entries must include a valid email address, or we won't be able to contact you if you win! All information provided remains confidential and will not be given to any third party. Your email address will only be used by Book Review Sisters to contact you in the event that you win. If you are contacted and advised you are the winner, you will have 1 week to provide us with the address for postage of your prize. That was a very enjoyable interview. Thanks, Kristin, for proving that "Christian" and "Chick Lit" are not mutually exclusive terms. I think both me and my 12 year old daughter would enjoy this. Sounds good - I'm glad to be introduced to this blog - I love finding good Christian fiction! So nice to have you all stop by ladies! Paula, make sure you get yourselves into the comp so you have a chance to win!